NASA photographers have always understood that taking pictures of space launches is a risky business. No one is more familiar with this than Bill Ingalls, a NASA photographer who has taking pictures for the agency for the past 30 years. Both within the agency and without, his creativity and efforts are well known, as his ability to always know exactly where to set up his cameras to get the perfect shots. Which naturally begs the question, what happened to the camera featured in the image above? This photograph, which shows one of Ingalls remote cameras thoroughly-melted, has been making the rounds on social media of late. As the accompanying gif (seen below) shows, the camera was not far from the launch pad and was then quickly consumed by the resulting fire. As Ingalls explained in a recent NASA press release, the destruction of the camera was the result of an unexpected brush fire that was triggered when flames from the launching rocket set some of the nearby grass on fire. The event he was photographing was the launch of the NASA/German Gravity Recovery and Climate Experiment Follow-on (GRACE-FO) satellite, which took place at Vandenberg Air Force Base on May 22nd, 2018. As part of a partnership between NASA and the German Research Center for Geosciences (GFZ), this satellite is the successor to the original GRACE mission, which began orbiting Earth on March 17th, 2002. 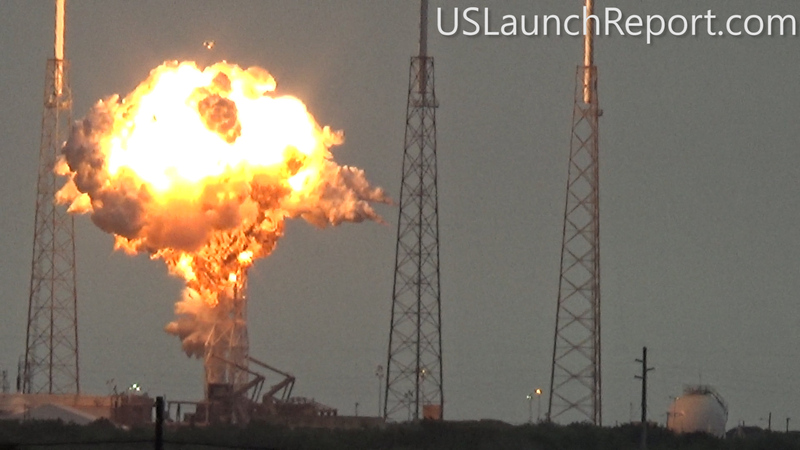 Unfortunately, the launch triggered a brush fire which engulfed the camera and cause its body to melt. Firefighters reported to the scene to put out the fire, who then met Ingalls where he returned to the site. Luckily for Ingalls, and the viewing public, he was able to force open the body and retrieve the memory card, which had not been damaged. As a result, the footage of the fire as it approached the camera was caught. Oddly enough, this camera was the one posted furthest from the launch pad, about 400 meters (a quarter of a mile) away. The four other cameras that were set up inside the perimeter were undamaged, as was the other remote camera. But before anyone starts thinking that this remote was the unfortunate one, the “toasty” camera, as Ingalls calls it, is likely to put on display at NASA Headquarters in Washington, DC. In the meantime, Ingalls will be traveling to Kazakhstan to photograph the June 3rd landing of the International Space Station’s Expedition 55 crew. He anticipates that that assignment, unlike this last one, will have no surprises! KENNEDY SPACE CENTER, FL – With Sunday’s successful Falcon 9 blastoff for Iridium Communications joining rocketry’s history books, Elon Musk’s SpaceX accomplished a double headed American space spectacular this weekend with 2 launches and 2 booster landings in 2 days from 2 coasts for 2 commercial customers – in a remarkably rapid turnaround feat that set a new record for minimum time between launches for SpaceX. On Sunday, June 25 at 1:25 p.m. PDT (4:25 p.m. EDT; 2025 UTC) a SpaceX Falcon 9 rocket successfully launched a second set of ten Iridium Next mobile voice and data relay communications satellites to low Earth orbit on the Iridium-2 mission from SLC-4E on Vandenberg Air Force Base in California. “All sats healthy and talking,” tweeted Matt Desch, Iridium Communications CEO, soon after launch and confirmation that all 10 Iridium NEXT satellites were successfully deployed from their second stage satellite dispensers. Iridium is a global leader in mobile voice and data satellite communications. The US West Coast Falcon 9 liftoff of the Iridium-2 mission from California on Sunday, June 25 took place barely 48 hours after the US East Coast Falcon 9 liftoff of the BulgariaSat-1 mission from Florida on Friday, June 23. Without a doubt, Musk’s dream of rocket reusability as a here and now means to slash the high costs of launching to space and thereby broaden access to space for more players is rapidly taking shape. Following separation of the first and second stages, the Falcon 9’s 15 story tall first stage successfully landed on the “Just Read the Instructions” droneship ocean going platform stationed several hundred miles out in the Pacific Ocean off the coast of California, despite challenging weather conditions. Indeed the droneships position was changed in the final minutes before launch due to the poor weather. “Droneship repositioned due to extreme weather. Will be tight,” tweeted Musk minutes before liftoff. The 156 foot tall booster touched down about 8 and ½ minutes after liftoff from Vandenberg AFB. The launch, landing and deployment of the 10 Iridium Next satellites was all broadcast live on a SpaceX webcast. The perfectly executed Iridium-2 and BulgariaSat-1 launch and landing duo clearly demonstrates the daunting capability of SpaceX’s privately owned and operated engineering team to pull off such a remarkable feat in nimble fashion. The stage was set for the unprecedented Falcon 9 launch doubleheader just a week ago when SpaceX CEO and billionaire founder Elon Musk tweeted out the daring space goal after all went well with the Florida Space Coast’s static hotfire test for the first in line BulgariaSat-1 flight. Check out the expanding gallery of Bulgariasat-1 eyepopping photos and videos from several space journalist colleagues and friends and myself. Click back as the gallery grows ! Sunday’s Iridium 2 flight was Iridium Communications second contracted launch with SpaceX. “This payload of 10 satellites was deployed into low-Earth orbit, approximately one hour after a SpaceX Falcon 9 rocket lifted off from Vandenberg,” Iridium said in a statement. The Mini Cooper sized Iridium NEXT satellites each weigh 1,900 pounds, totaling approximately 19,000 pounds placed into space. That is the weight of a semi tractor trailer truck! The inaugural Iridium 1 launch with the first ten Iridium Next satellites took place successfully at the start of this year on Jan. 14, 2017. The new set of ten Iridium Next mobile relay satellites were delivered into a circular orbit at an altitude of 625 kilometers (388 miles) above Earth. They were released one at a time from a pair of specially designed satellite dispensers at approximately 100 second intervals. Iridium 2 is the second of eight planned Falcon 9 launches to establish the Iridium NEXT constellation which will eventually consist of 81 advanced satellites. At least 75 will be launched by SpaceX to low-Earth orbit, with 66 making up the operational constellation. The inaugural launch of the advanced Iridium NEXT satellites in January 2017 started the process of replacing an aging Iridium fleet in orbit for nearly two decades. Nine of the 81 will serve as on-orbit spares and six as ground spares. “Now, and for approximately the next 45 days, these newly launched satellites will undergo a series of testing and validation procedures, ensuring they are ready for integration with the operational constellation,” said Iridium. “We are thrilled with yesterday’s success. These new satellites are functioning well, and we are pressing forward with the testing process,” said Scott Smith, chief operating officer at Iridium. BulgariaSat-1 and Iridium-2 count as the eighth and ninth SpaceX launches of 2017. Including these two ocean platform landings, SpaceX has now successfully recovered 13 boosters; 5 by land and 8 by sea, over the past 18 months. Both landing droneships are now headed back into their respective coastal ports. It’s a feat straight out of science fiction but aimed at drastically slashing the cost of access to space as envisioned by Musk. Watch for Ken’s onsite mission reports direct from the Kennedy Space Center and Cape Canaveral Air Force Station, Florida. With Billions and Billions of dollars at stake and their reputation riding on the line, SpaceX came roaring back to life by dramatically executing a picture perfect Falcon 9 rocket launch this morning (Jan. 14) that successfully delivered a fleet of ten advanced Iridium NEXT mobile voice and data relay satellites to orbit while simultaneously recovering the first stage on a ship at sea off the west coast of California. BREAKING NEWS – check back for updates. The primary goal of SpaceX’s Falcon 9 launch from Space Launch Complex 4E on Vandenberg Air Force Base in California was to deploy the payload of the first ten Iridium Next communication satellites to low Earth orbit on the Iridium-1 mission. “Thanks @elonmusk – a perfect flight! Loved watching sats deploy with you in the control room,” tweeted Matt Desch, Iridium Communications CEO, soon after receiving full confirmation that all 10 Iridium NEXT satellites were successfully deployed from their second stage satellite dispensers. The inaugural ten will serve as the vanguard of a fleet that will eventually comprise 81 satellites. Today’s successful blastoff took place barely four and a half months after another Falcon 9 and its $200 million Israeli commercial payload were suddenly destroyed during a prelaunch fueling test on the Florida Space Coast on Sept. 1, 2016. Another launch failure would have dealt a devastating blow to confidence in SpaceX’s hard won reputation. The Sept. 1, 2016 calamity was the second Falcon 9 failure within 15 months time. Both occurred inside the second stage and called into question the rockets reliability. The 229-foot (70-meter) Falcon 9 rocket was rolled out from its processing hangar to the launch pad and raised vertically yesterday. Today’s entire land, landing and satellite deployment event was shown live on a SpaceX hosted webcast. It offered extremely sharp views of Saturdays on time liftoff at 9:54:34 a.m. PST or 12:54:34 p.m. EST, and unbelievably clear images of the first stage descending back to Earth towards a tiny drone ship. “Overall a wonderfully nominal mission,” gushed the SpaceX commentator during the webcast. Since the Iridium 1 mission only had an instantaneous launch opportunity precisely at 9:54:34 a.m. PST or 12:54:34 p.m. EST, there was no margin for any technical or weather delays. And none happened. Although an errant boat had to be quickly escorted out of the exclusion zone less than 20 minutes before blastoff. Confirmation of a successful deployment of all 10 Iridium NEXT satellites came at about T plus 1 hour and 17 minutes after liftoff from Vandenberg. “So, so excited – finally breathing again!” tweeted Desch. The mobile relay satellites were delivered into a circular orbit at an altitude of 625 kilometers (388 miles) above Earth. “It was a clean sweep, 10 for 10,” said SpaceX commentator John Insprucker during the live webcast. The Iridium NEXT satellites were built by Thales Alenia and Orbital ATK. In the final moments before the propulsive landing, you could read the lettering on the “Just Read the Instructions” drone ship as the engine was firing to slow the descent and the landing legs deployed. Really there was no cutout or loss of signal the whole way down. So the world could watch every key moment as it happened in real time. The first stage softly landed approx. 8 minutes and 18 seconds after the California liftoff. “First stage has landed on Just Read the Instructions,” SpaceX tweeted post landing. This was the first launch by SpaceX since last August from the Florida Space Coast, and it came off without a hitch. Iridium 1 is the first of seven planned Falcon 9 launches to establish the Iridium NEXT constellation which will eventually consist of 81 advanced satellites. At least 70 will be launched by SpaceX. The inaugural launch of the advanced Iridium NEXT satellites will start the process of replacing an aging Iridium fleet in orbit for nearly two decades. This Falcon 9 was been outfitted with four landing lags and grid fins for a controlled landing on the tiny barge prepositioned in the Pacific Ocean several hundred miles off the west coast of California. Watch this space for continuing updates on SpaceX. The stakes could almost not be higher for SpaceX as the firm readies their twice failed Falcon 9 rocket for a blastoff resumption on Saturday morning, Jan. 14 carrying the vanguard of the commercial Iridium NEXT satellite fleet to orbit from their California rocket base. Barely four and a half months after another Falcon 9 and its $200 million Israeli commercial payload were suddenly destroyed during a prelaunch fueling test on the Florida Space Coast on Sept. 1, 2016, SpaceX says all systems are GO for the ‘Return to Flight’ launch of a new Falcon 9 on the Iridium-1 mission from the California coast tomorrow. Another launch failure would deal a devastating blow to confidence in SpaceX’s hard won reputation – so ‘Failure is Not an Option’ as they say in the space business. The 229-foot (70-meter) Falcon 9 rocket has been rolled out from its processing hangar to the launch pad and raised vertically. “Beautiful picture of our ride to space tomorrow on the launch pad this morning!” tweeted Matt Desch, Iridium Communications CEO, featuring the lead photo in this story. A license for permission to proceed with the launch originally last Sunday was only granted by the FAA last Friday, Jan. 6. But poor California weather in the form of stormy rains and high winds forced further delays to Saturday. Today, Friday the 13th, it’s T-Minus 1 Day to the inaugural launch of the advanced Iridium NEXT voice and data relay satellites. Liftoff of the SpaceX Falcon 9 with the payload of 10 identical next generation Iridium NEXT communications satellites is slated for 9:54:39 am PST or 5:54:39 pm UTC from Space Launch Complex 4E on Vandenberg Air Force Base in California. The Iridium 1 mission only has an instantaneous launch opportunity precisely at 9:54:34 a.m. PST or 12:54:34 p.m. EST. Weather forecasters currently predict about a 60 percent chance of favorable conditions at launch time. Sunday, Jan. 15 is available as a back-up launch opportunity in case of a delay for any reason including technical and weather related issues. “The teams from Iridium, SpaceX and our partners are in the homestretch for the first launch of the Iridium NEXT satellite constellation,” said satellite owner Iridium Communications. Meanwhile the launch teams have completed the countdown dress rehearsal’ and Launch Readiness Review in anticipation of the morning liftoff. Iridium says that every precaution has been taken to ensure a successful launch. “There are so many variables that need to be considered when finalizing launch preparations, and a slight deviation or unexpected behavior by any of them can jeopardize the launch integrity,” said Iridium COO Scott Smith, in a statement. After the Sept .1 calamity SpaceX conducted a four month long investigation seeking to determine the root cause. And it was just last Friday, Jan. 6, that the FAA finally granted SpaceX a license to launch the ‘Return to Flight’ Falcon 9 mission – as I confirmed with the FAA. The SpaceX investigation report into the total loss of the Falcon 9 rocket and AMOS-6 payload has not been released at this time. The FAA has oversight responsibility to encourage, facilitate, and promote U.S. commercial space transportation and ensure the protection of public safety. In addition to the launch, SpaceX plans to continue its secondary objective of recovering the Falcon 9 first stage via a propulsive soft landing – as done several times previously and witnessed by this author. The Iridium-1 mission patch featured herein highlights both the launch and landing objectives. The goal is to eventually recycle and reuse the first stage – and thereby dramatically slash launch costs per Musk’s vision. This Falcon 9 has been outfitted with four landing legs and grid fins for a controlled landing on a tiny barge prepositioned in the Pacific Ocean several hundred miles off the west coast of California. In the face of unrelenting days of very poor weather and a range conflict with another very critical rocket launch, SpaceX is pushing back the return debut of their private Falcon 9 rocket carrying a revolutionary fleet of voice and data commercial communications relay satellites for Iridium to no earlier than next weekend, Jan 14. Earlier indications of a nearly weeks long launch delay from Monday, Jan. 9 to next Saturday morning, Jan. 14, were officially confirmed today, Jan. 8, by SpaceX and their Iridium Communications customer. “Launch moving due to high winds and rains at Vandenberg,” SpaceX announced today, Jan. 8. Liftoff of the SpaceX Falcon 9 with the payload of 10 identical next generation Iridium NEXT communications satellites had been slated for 10:22 am PST (1:22 pm EST), Jan. 9, 2017 from Space Launch Complex 4E on Vandenberg Air Force Base in California. The advanced next satellites will start the process of replacing an aging Iridium fleet in orbit for nearly two decades. And it was less than 48 hours ago on Friday, Jan. 6, that the FAA finally granted SpaceX a license to launch the ‘Return to Flight’ Falcon 9 mission – as I confirmed with the FAA here. The private rocket – developed by CEO Elon Musk and his company – has been grounded for four months since a catastrophic launch pad explosion last September suddenly destroyed another Falcon 9 and its $200 million Israeli owned satellite during a prelaunch fueling test on the Florida Space Coast. The prognosis of a week of bad California weather had been known for some time and finally prompted an official announcement just 24 hours before the hoped for launch. “With high winds and rain in the forecast at Vandenberg Air Force Base, the first launch of 10 Iridium NEXT satellites is now planned for January 14th at 9:54:34 am PST with a back-up date of January 15th,” Iridium officials elaborated in a statement. The mission, known as Iridium 1, has an instantaneous launch opportunity at 9:54:34 a.m. PST (12:54:34 p.m. EST). Next Sunday, Jan. 15 is available as a back-up launch opportunity in case of a delay for any reason including technical and weather related issues. Furthermore, humorous pleas by Iridium CEO Matt Desch for divine intervention went unheeded ! “Can now confirm: new launch date Jan 14 at 9:54am pst. Bad weather the cause. Anti-rain dances didn’t work – oh well. Cal needs rain?” said Iridium CEO Matt Desch when he threw in the towel this morning by tweet. Things change fast and furious in the rocket business, and flexibility is the name of the game if you want to survive the frequently changing landscape. A contributing factor to the delay is a range conflict with an upcoming Atlas rocket launch for the U.S National Reconnaissance Organization (NRO) at Vandenberg AFB. “Other range conflicts this week results in next available launch date being Jan 14,” SpaceX confirmed. The United Launch Alliance Atlas V is scheduled to launch the super secret NROL-79 spy satellite for the NRO on Jan. 26. Prior to the launch, ULA must conduct a wet dress rehearsal (WDR) of the Atlas V by fueling it with propellants to confirm its readiness to launch. The clandestine NROL-79 intelligence-gathering payload is critical to US national defense. Surly it was manufactured over a time span of several years at an unknown classified cost probably amounting to billions of dollars. For the Iridium – 1 mission the 229-foot (70-meter) Falcon 9 will carry a fleet of ten Iridium NEXT mobile voice and data relay satellites to orbit from Vandenberg Air Force Base, Ca, for Iridium Communications. The FAA license approved on Jan. 6 covers all seven launches. So besides the launch, SpaceX plans to continue its secondary objective of recovering the Falcon 9 first stage via a propulsive soft landing – as done several times previously and witnessed by this author. This Falcon 9 has been outfitted with four landing lags and grid fins for a controlled landing on a tiny barge prepositioned in the Pacific Ocean several hundred miles off the west coast of California. Desch says that all seven of his Falcon’s will be new – not reused. “All our seven F9s are new,” Desch tweeted. On Jan. 2, SpaceX issued a statement ascribing the Sept. 1, 2016 AMOS-6 launch pad anomaly as being traced to a failure wherein one of three high pressure helium storage tanks located inside the second stage liquid oxygen (LOX) tank of the Falcon 9 rocket suddenly burst. Cold helium is used to pressurize the propellant tanks. They provided some but not many technical details. The failure apparently originated at a point where the helium tank “buckles” and accumulates oxygen – “leading to ignition” of the highly flammable superchilled oxygen propellant in the second stage when it came into contact with carbon fibers covering the helium tanks – also known as composite overwrapped pressure vessels (COPVs). “Friction ignition” between the carbon fibers acting as a friction source and super chilled oxygen led to the calamitous explosion, SpaceX concluded was the most likely cause of the disaster. Watch this space for continuing updates as SpaceX rolls the rocket out from the processing hangar and we watch the saga of the foggy weather forecast with great anticipation ! After an intensive four month investigation into why a SpaceX Falcon 9 rocket exploded without warning on the launch pad last September, the company today announced the failures likely cause as well as plans of a rapid resumption of flights as soon as next Sunday, Jan. 8, from their California launch complex – carrying a lucrative commercial payload of 10 advanced mobile relay satellites to orbit for Iridium Communications. “Targeting return to flight from Vandenberg with the @IridiumComm NEXT launch on January 8,” SpaceX announced on their website today, Monday, Jan. 2., 2017. “Our date is now public. Next Sunday morning, Jan 8 at 10:28:07 pst. Iridium NEXT launch #1 flies!” Iridium Communications CEO Matt Desch quickly confirmed by tweet today, Jan 2. SpaceX has been dealing with the far reaching and world famous fallout from the catastrophic launch pad explosion that eviscerated a Falcon 9 and its expensive $200 million Israeli Amos-6 commercial payload in Florida without warning, during a routine preflight fueling test on Sept. 1, 2016, at pad 40 on Cape Canaveral Air Force Station. “We have been working closely with NASA, and the FAA [Federal Aviation Administration] and our commercial customers to understand it,” said SpaceX CEO Elon Musk. Via the “fault tree analysis” the Sept. 1 anomaly has been traced to a failure in one of three gaseous helium storage tanks located inside the second stage liquid oxygen (LOX) tank of the Falcon 9 rocket, according to a statement released by SpaceX today which provided some but not many technical details. The failure apparently originated at a point where the helium tank “buckles” and accumulates oxygen – “leading to ignition” of the highly flammable liquid oxygen propellant in the second stage. Apparently the super chilled LOX or SOX can pool in the buckles and react with carbon fibers in the overwrap – which act as an ignition source. As part of the most recent upgrade to the Falcon 9, SpaceX changed their fueling procedure to include the use of densified oxygen – or super chilled oxygen – in order to load more propellant into the same volume, at a lower temperature of about minus 340 degrees Fahrenheit for SOX vs. about minus 298 degrees Fahrenheit for LOX. In essence SpaceX gets more gallons of super chilled oxygen into the same tank volume because of the higher density – and they don’t have to change the rocket’s dimensions. This temperature change enables the Falcon 9 to launch heavier payloads. However the side effect of the superchilling process is that the oxygen is now very close to its freezing point – with the potential to partially solidify , rather than being a completely free flowing liquid. Then the resulting friction with carbon fibers can ignite the pooled oxygen resulting in an instantaneous fireball and destruction of the rocket – as happened to Falcon 9 and Amos-6 at pad 40 on Sept. 1, 2016. This same Falcon 9 rocket will be used to launch our astronauts to the ISS in 2018 – seated inside a Crew Dragon atop the helium tank bathed in super chilled LOX. The short term fixes involve simpler changes to the COPV configuration and modifying the helium loading conditions. So it remains to be seen if SpaceX continues the use of densified oxygen or not in the near term. The long term fixes involve changing the COPV hardware itself and will take longer to implement. They are also likely to be more effective – but only time will tell. Liftoff of the SpaceX Falcon 9 with the payload of 10 identical next generation IridiumNEXT communications satellites will take place from Space Launch Complex 4E on Vandenberg Air Force Base in California – assuming the required approval is first granted by the Federal Aviation Administration (FAA). Last week, the first ten IridiumNEXT mobile voice and data relay satellites were fueled, stacked and tucked inside the nose cone of the Falcon 9 rocket designated as SpaceX’s ‘Return to Flight’ launcher in order to enable a blastoff as soon as possible after an approval is received from the FAA. “Iridium is pleased with SpaceX’s announcement on the results of the September 1 anomaly as identified by their accident investigation team, and their plans to target a return to flight on January 8 with the first Iridium NEXT launch” Iridium Communications said on their website today, Jan. 2. Another milestone to watch for is the first stage engine static fire test that SpaceX routinely conducts several days prior to the launch. Thats exactly the same type test where the Falcon 9 blew up in Florida some five minutes before the short Merlin 1D engine ignition to confirm readiness for the real launch that had been planned for 2 days later. The Iridium 1 mission is the first of seven planned Falcon 9 launches – totaling 70 satellites. “Iridium is replacing its existing constellation by sending 70 Iridium NEXT satellites into space on a SpaceX Falcon 9 rocket over 7 different launches,” says Iridium. The goal of this privately contracted mission is to deliver the first 10 Iridium NEXT satellites into low-earth orbit to inaugurate what will be a new constellation of satellites dedicated to mobile voice and data communications. Iridium eventually plans to launch a constellation of 81 Iridium NEXT satellites into low-earth orbit. “At least 70 of which will be launched by SpaceX,” per Iridium’s contract with SpaceX. Meanwhile pad 40, which was heavily damaged during the Sept. 1 explosion, is undergoing extensive repairs and refurbishments to bring it back online. It is not known when pad 40 will be fit to resume Falcon 9 launches. In the interim, SpaceX plans to initially resume launches from the Florida Space Coast at the Kennedy Space Center (KSC) from pad 39A, the former shuttle pad that SpaceX has leased from NASA. Commercial SpaceX launches at KSC could start from pad 39A sometime in early 2017 – after modifications for the Falcon 9 are completed. The Sept. 1 calamity was the second Falcon 9 failure within 15 months time and called into question the rockets overall reliability. Both incidents involved the second stage helium system, but SpaceX maintains that they are unrelated. The first Falcon 9 failure involved a catastrophic mid air explosion in the second stage about two and a half minutes after liftoff, during the Dragon CRS-7 cargo resupply launch for NASA to the International Space Station on June 28, 2015 – and witnessed by this author. The accident was traced to a failed strut holding the helium tank inside the liquid oxygen tank. The helium tank dislodged and ultimately ruptured the second stage as the first stage was still firing resulting in a total loss of the rocket and payload. Technicians have fueled, stacked and tucked the first ten advanced IridiumNEXT mobile voice and data relay satellites inside the nose cone of a Falcon 9 rocket designated as SpaceX’s ‘Return to Flight’ launcher – potentially as early as next week – from their west coast launch pad on Vandenberg Air Force Base in California. “Milestone Alert: The first ten #IridiumNEXT satellites are stacked and encapsulated in the Falcon 9 fairing,” Iridium Communications announced on the company website on Thursday, Dec. 29. The excitement of a possibly imminent liftoff is clearly building – at least for Iridium Communications and their CEO Matt Desch. “Our first 10 #IridiumNEXT satellites are all fueled now, tucked in and dreaming of flying in space. Very. Soon. Happy Holidays!” Iridium Communications CEO Matt Desch tweeted on Christmas Day, Dec. 25, 2016. But SpaceX is still dealing with the fallout from the catastrophic launch pad explosion that eviscerated a Falcon 9 and its expensive commercial payload in Florida without warning, during a routine fueling test on Sept. 1, 2016. Liftoff of the SpaceX Falcon 9 with the payload of 10 identical next generation IridiumNEXT communications satellites from Vandenberg’s Space Launch Complex 4-East could come as soon as next week – in early January 2017 perhaps as soon as Jan. 7. SpaceX CEO Elon Musk had said he hoped to resume Falcon 9 launches before the end of this year 2016 – while investigating the root cause of the devastating mishap. But the launch has been repeatedly postponed and pushed off into 2017 while investigators plumb the data for clues and fix whatever flaws are uncovered. “Iridium’s @Falcon9_rocket in processing at @VandenbergAFB, getting ready for our launch in early Jan. Progress! #Thistimeitsforreal!” Desch elaborated. Nevertheless, there has been no official statement issued by either SpaceX or Iridium Communications announcing a specific target launch date. And the liftoff is completely dependent on achieving FAA approval for the Falcon 9 launch. “This launch is contingent upon the FAA’s approval of SpaceX’s return to flight following the anomaly that occurred on September 1, 2016 at Cape Canaveral Air Force Station, Florida,” Iridium said in a prior statement, reported here. All SpaceX Falcon 9 launches immediately ground to a halt following the colossal eruption of a fireball from the Falcon 9 at the launch pad that suddenly destroyed the rocket and completely consumed its $200 million Israeli Amos-6 commercial payload on Sept. 1 during a routine fueling and planned static fire engine test at Cape Canaveral Air Force Station in Florida. The explosive anomaly resulted from a “large breach” in the cryogenic helium system of the second stage liquid oxygen tank and subsequent ignition of the highly flammable oxygen propellant. Meanwhile, SpaceX and Iridium are preparing the payload and rocket for launch as soon as possible after FAA approval is granted. “Satellites have been fueled, pressurized & dispenser tiers are being stacked as we move closer to first launch #IridiumNEXT #NEXTevolution,” Iridium elaborated with photos showing the recent processing in progress. The Iridium mission is the first of seven planned Falcon 9 launches – totaling 70 satellites. “There were many challenges on the program, from orbit determination knowledge design, to encryption design, to integration and verification test planning, to planning for on orbit acceptance activities, but the team made it all come together and the satellites are ready for deployment to enhance the future of mobile satellite communications — I could not be more proud,” Joel Rademacher, Ph.D, Director, Systems Engineering for Iridium Next, said in a statement. Besides the launch, SpaceX plans to continue its secondary objective of recovering the Falcon 9 first stage via a propulsive soft landing – as done several times previously and witnessed by this author. Desch says that all seven of his Falcon’s will be new – not resued. SpaceX maintains active launch pads on both the US East and West coasts. On the Florida Space Coast, SpaceX plans to initially resume launches at the Kennedy Space Center (KSC) from pad 39A, the former shuttle pad that SpaceX has leased from NASA. SpaceX is postponing the resumption of launches for their Falcon 9 rocket into early January 2017 as they continue to deal with the fallout from the catastrophic launch pad explosion in Florida that destroyed a Falcon 9 during preflight test operations three months ago. The new space aerospace company led by billionaire CEO Elon Musk had planned to restart launches as early as next week on Dec 16, for the boosters ‘Return to Flight’ Falcon 9 mission from California with a payload comprising Iridium Corporation’s next-generation communications satellites. The Iridium mission is the first of seven planned launches. “Iridium is replacing its existing constellation by sending 70 Iridium NEXT satellites into space on a SpaceX Falcon 9 rocket over 7 different launches,” noted Iridium in a statement. However, the launch date was pending until approval by the FAA – which will not yet be forthcoming in time to meet the Dec. 16 target date. The FAA can’t approve a launch until they have a report to review from SpaceX. And that final accident investigation report has not yet been written by SpaceX or submitted to the FAA. In a new update, SpaceX announced that they “are finalizing the investigation into our September 1 anomaly” and need to “complete extended testing” – thus inevitably delaying the hoped for blastoff into early January 2017. One should not be surprised if there are further delays into the ‘Return to Flight’ since the determination of root cause, testing fixes and finally implementing effective corrective action will take time. This is rocket science and it’s not easy. SpaceX is still investigating why the rocket unexpectedly erupted into a humongous fireball at pad 40 on Sept. 1, that completely consumed the rocket and its $200 million Amos-6 Israeli commercial payload during a routine fueling and planned static fire engine test at Cape Canaveral Air Force Station in Florida. “We are finalizing the investigation into our September 1 anomaly and are working to complete the final steps necessary to safely and reliably return to flight, now in early January with the launch of Iridium-1,” SpaceX announced in a statement. Iridium Communications had recently announced that the first launch of a slew of its next-generation global satellite constellation, dubbed Iridium NEXT, would launch atop a SpaceX Falcon 9 rocket on December 16, 2016 at 12:36 p.m. PST from SpaceX’s west coast launch pad on Vandenberg Air Force Base in California. But since only 3 months had elapsed since the accident – the second in 15 months – more time was clearly needed to be certain the rocket was truly flight worthy. “This allows for additional time to close-out vehicle preparations and complete extended testing to help ensure the highest possible level of mission assurance prior to launch,” SpaceX elaborated. Iridium also issued a statement supporting the launch delay and expressing continued confidence in SpaceX.